Kalamarka. Bolivian Music Types. Bolivia Culture. Famous People From Bolivia. The Mystical Music of Kalamarka! (ESPAÑOL) Kalamarka is one of my favorite Andean music groups and I recently had the chance to interview one of the group's founders, Rodolfo Choque. What was supposed to be a brief Q&A began with "So where are you from?" "Oh, I'm from the United States!" (???) Let's just say that after nearly three hours, I'm still not sure who interviewed who! Although they have homes and offices in La Paz, for many years now the members of Kalamarka have lived between Bolivia and France. They travel all over the world giving concerts and Andean Cosmovision lectures. Screeeeeeeech. That's right. Rodolfo tells me that in every city they play they request the chance to speak at a school or university to share about the history of the Aymara culture, their beliefs and their vision for the future, which the Aymara people call the Andean Cosmovision. "Somos seres puente" ("we are bridge people") said Rodolfo (on the right in this photo), whose destiny it is to transmit the cosmovision to the general population so that we may all have an easier cross-over into what is to be a new era (called the Willka Khuti which will begin in 2012 according to their beliefs). This is to be an era of spiritual cleansing meant to unify the peoples of the Earth and universe (although the Aymara call it the multiverso, not universo) and bring us back to a true understanding of "community". This of course took the interview in an entirely new direction as over the next three hours Rodolfo patiently explained what exactly this entailed to me. The Aymara believe their history goes back 40,017 years and this history has been passed down from generation to generation orally and without fail by the Abuelos (grandfathers). They also believe they are the guardians of the Earth. Today there are Andean Cosmovision lectures and courses being given all over the world. In La Paz you can attend one of these lectures each Monday from 7-9 p.m. at the Museo Tiwanaku. Amid explanations of how the Andean calendar is divided into 20,000-year periods called moons (and each moon has 5 suns, each lasting 4000 years); how the Aymaras calculate exactly when the Milky Way will align with the Southern Cross; and how America is actually not named after Amerigo Vespucci but rather the ancient language spoken on the continent for thousands of years before he arrived (Amaruka); I somehow managed to get a few questions in about Kalamarka and their rather shorter history as musicians. The word Kalamarka literally means "hard or lasting people" or "eternal men". The group is busy recording a new album this month (May 2009) in La Paz which should be available for sale by June. While I spoke to Rodolfo, who just recently returned from France, band members were busy setting up a new office in La Paz. The group has several tour dates scheduled for July in the United States. 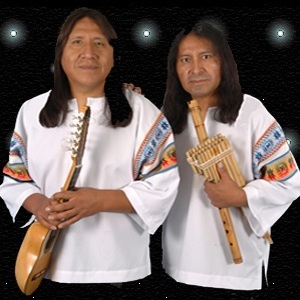 Kalamarka was founded in 1984 in the city of La Paz, Bolivia by Hugo Gutiérrez (singer and composer) and Rodolfo Choque (flautist). They’ve studied the indigenous musical styles of several regions of Bolivia and, as a result, have created their own style of music and musical poetry with new effects and a personality that, over time, has led them to become of the most important Latin American groups of the past few decades. Their musical style is defined by their research of Andean sounds and instruments complemented by modern electronic and digital instruments. They’ve traveled to almost every continent and played their music in many, many countries in Europe, America, Asia and Africa and have since gained international acclaim. They participate continually in festivals, give concerts and make television appearances, striving always to represent their origins with dignity. Much of their music contains messages about the need to respect nature. They visit schools and in Europe, especially in France, regularly share at schools and universities in various cities. They transmit the need to know and preserve one’s origins, and respect the ancient human values of the American ethnias. They also try to transmit the importance of social inclusion and social exchange and regularly include styles adopted from Bolivian indigenous groups such as the Aymara, Quechua, Ayoreos, Chiriguanos, Chipayas, Matacos, Yanomamis, Minquitos, Guarani, Araucanos, and others. From the moment they formed Kalamarka, they’ve always been involved with children, participating in many different extracurricular activities such as fashioning instruments, and giving lessons to children in the use of native Andean instruments such as the sikus, toyos, sankas, maltas, chullys, quenas, quenachos, antaras, tarkas, moceños, charango, and also percussion instruments, bombos, guitar and singing. They’ve also participated in helping to form other folkloric song and dance groups. Because of their continuous involvement Kalamarka has become one of the most successful Andean folklore groups in the world. Their albums include “Bolivia Wawanacanapjtua”, “Cuando Florezca el Chuño”, “Por la Defensa de la Naturaleza”, “Solo Por Ti”, “Americas”, “The Best of Andean Music”, “Por la Igualdad de Razas y Derechos”, and “Guardian del Amazonas”, all of which contain messages about the importance of social inclusion and equality and about the conservation of nature. To understand their motivation, you have to understand that Bolivia’s indigenous communities are naturalists. Every element in nature and every mountain, river, plant and animal is an important and essential element of life and death. Many of them are attributed human sentiments and characteristics and many are considered gods and have names. Bolivia’s many indigenous communities have maintained their rich traditions, folklore, and beliefs and this is manifested in their oral histories and lore, in their art and music, and in their love for all things natural. This is evident in their prayers, poems, songs and offerings to Tati Inti (Father Sun), Pachamama (Mother Earth), the mountains of the region (such as Illimani and Illampu, both gods) and many other natural features to whom they are devout. The Spring Equinox is a special time in Andean lore, for example. In this video you can hear a Mallku as he prays to the gods and mountains of the world (including Mount Everest) for unity among all people. This is a video of the actual ritual with Kalamarka’s music in the background, as a “mallku” prays to the Great Minds (red video). All of this Kalamarka transmits through their music. Although the members of Kalamarka are from the Andean region of Bolivia, they’ve studied the beliefs and folklore of other indigenous groups in Eastern and Southern Bolivia as well and have included songs in their repertoire that reflect this, such as Ama Amazonas (green video) and Guardian del Amazonas which is about the macheteros of the northeastern region of Moxos in the Department of Beni. You can see them in the background with the typical headdresses of the region (yellow video). On their website they have links to several letters written to the God of the Andes. In reading these letters and the story of the new cosmovision, you come to understand where the beauty and ethereal quality of Kalamarka’s music comes from and the message it carries. After reading this short summary you’ll hear something new in their music. The Andean communities believe that a new age is dawning for which the gods have been preparing for several millenia. Kalamarka’s interest in working with children lies in the fact that the Andean peoples believe the gods have designated certain children and young people to be Sariris (which literally means “messengers of the universe”). In the Andean cosmovision, they believe that several new generations of children have been born into this world and that the grandmothers and grandfathers have been training them for the past 4000 years to teach us to live in a new stage of life and consciousness called the Pachakutic, which began in 1992 and will come to fruition in 2012. By being born among us their genetic code will mix with ours and alter ours as needed for us to be one with the universe. In this beautiful video you can see the ruins of Tiawanaku, one of the religious centers of the Andes. The songs begins with the words "The Earth is reborn, Life is reborn, a new sun is rising to reconquer the lost land, a new sun is rising to illuminate the way for Aymaras, Quechuas, Tupi Guaranis..."
The Mayiris are the first generation, which began in 1970. They will unify what is human with what is divine. These beings will act as bridges and represent the first change in the human genetic code. They seek universal unification and to re-establish the community (in Spanish comunidad which means common unity) as we are all brothers and sisters. The Payiris are the second generation and came down from the mountains in 1980. Their mission is to balance the two forces that interact in the universe known as positive and negative (Chacha and Warmi) in the various forms of expression of life. It is their mission to decode this language and return us to a universal abstract language, teaching us by sharing the teachings of the ancestors, and emphasizing spiritual living as the center for all activities. The Quimsiris are the third generation and arrived in 2001. They are interacting through a collective spirit and their genetic code will return us to the universal language, one in which we will speak not only with our words but with our thoughts (telepathy). They are polyglots and designers of the new reality. Soon the Pusiris (fourth generation) and Qalqoris (fifth generation) will arrive. When the Pachakutic takes place in the form of a universal change in our perceptions, we will need these “bridge” beings to be among us and some already are. This process will be completed in the year 2012. We should be unafraid of this change. We have to learn the new language of nature (which they call the Multiverse) because it will allow us to live together not only with other human beings but also to perceive the sounds and magic of Life itself. This is an urgent matter as the energies that are to converge upon the planet have a new dynamic, a new rhythm, a new frequency. It is urgent for each human being that has forgotten to follow the rhythm of Life to “fine tune” himself or herself in order to be able to follow the rhythm of Nature. It is urgent because everything that exists, even the insects, already follows this rhythm and only human beings do not. Kalamarka's song Florcita del Ande (Little Andean Flower), with its astoundingly atypical and uniquely ethereal rhythm, is a remarkable portrayal of how in tune the members of this culture are with the changes they believe are to come. After three hours I said, "Rodolfo my head is swimming with all this new information. I feel like I just came out of history class. I'm not sure how I'll put all of this together." To which he answered, "No vivas la historia, haz historia" (Don't live history, make history). "Gringuita," he said, "the Aymara do not say thank you." "Because we believe helping each other and doing for each other is just a normal part of daily living, something we're all expected to do, not a favor," he answered. "Oh," I said. "So how do you express appreciation?" "Sarantas kaskiñawi Kullaka" he said. (Let us continue walking together Sister). "Sarantas kaskiñawi, Jilata." (Let us continue walking together, Brother). All graphics, photographs and videos were provided by Kalamarka and are used on this site with their express permission. Use the above form to contact them for authorizations. Visit Kalamarka's YouTube Channel to see more videos or visit their website here.